Monthaven Arts and Cultural Center Honors Black History Month with Home. Heart. Heritage. Attendees of these unique, historical art workshops will experience the art of quilt making led by a Monthaven arts instructor. The workshops combine art appreciation and art history with hands-on activity and are open to all ages. 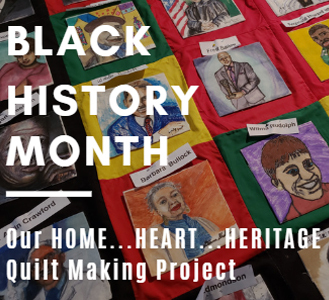 When complete, the quilt will be sewn together by local black quilters to tell the story of momentous black American figures who have influenced our nation. This quilt will become part of The MACC’s permanent collection and will be displayed yearly during Black History Month as part of our collection and ultimately as a part of our 5-year quilt project and traveling exhibition. For questions or more information contact The MACC at admin@themacctn.com or by phone at (615) 822-0789.